On the east side of the Dardesheim mountain there is a place called Gnome-Berg where the fields are especially rich and fertile. These acres were once owned by a smithy by the name of Riechert, who planted a crop of peas there. He noticed that when the peas hung on their vine and were the most ripe and succulent, they were soon all picked. 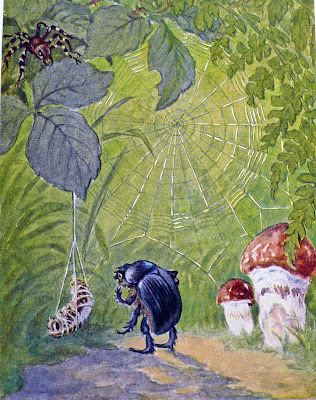 To catch the pea-thief, Riechert built a little hut in his field and watched over his crop night and day. During the night, he did not detect any change, but in the morning he saw that despite his watch, the entire field had been robbed of peas. His wasted efforts annoyed him to no end and so he decided to plow under the entire crop. When dawn broke, Smithy Riechert began his work. But he had barely plowed under half his field when he heard wretched crying. Looking down to find the source, he saw a gnome lying under the pea stalks on the ground. His skull had been bashed by the threshing blade and he was now visible because his haze or fog cap had been knocked from his head. The gnome got up quickly and fled back into the mountain. In fairy tale lore, gnomes are invisible because they wear a Tarnkappe or Nebelkappe (cap conferring invisibility). Nebel means fog or mist in German and connotes confusion or cloudy and muddled thinking. Gnomes love gardens and the acres they visit are always lush and bountiful. Even though they pinch the produce, it is very beneficial to have garden gnomes as regular visitors and very unlucky to drive them away. A wise farmer woos the gnomes and does what he can to keep them happy.